I'm about to let y'all in on a huge secret... my go to dip recipe that is DELICIOUS and oh so easy! It's only 5 ingredients. You are going to want to make it all the time especially in the warm months when avocados are on sale. Whenever we/someone is having a cookout or get together or pool party or any possible reason I can think of, this is what I make. Well not every. single. time. 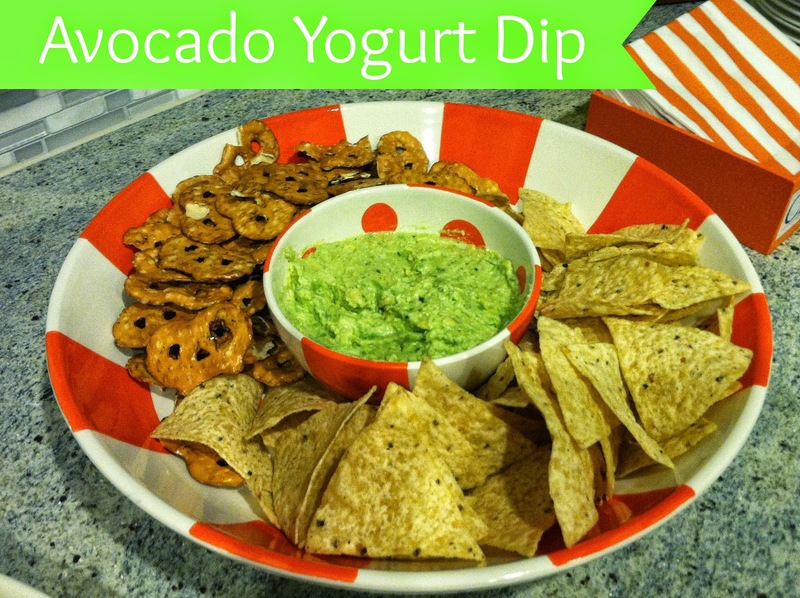 Sometimes you need to try something new but this dip is always a crowd-pleaser and goes well with most other foods so you might want to make extra! Scoop out avocado flesh into bowl. Add a heaping Tablespoon of yogurt per avocado - so for 3 avocados you would need 3 heaping Tbsp of yogurt (so super easy to adjust this for more or less). Add a 1/2 tsp garlic powder, 1/4 tsp chili powder and 1/4 tsp cumin. Add fresh ground pepper and a little salt to taste. Adjust all seasonings as needed. Chill 30 minutes prior to serving. As you can see this dip is wonderful with pretzel crisps and tortilla chips. It is also wonderful with vegetables, served on anything Mexican or on a salad. Enjoy! I wore this out to dinner with the hubby and my parents. I'm loving wearing my ankle boots with cuffed jeans (straight jeans rolled up twice). Also I must get a short sleeved version of this top (this one is long sleeved and oh so comfy) or one with white and black stripes for summer... there's just something about a cute striped tee! Lent is now over so I can shop again but I still haven't been shopping yet or bought anything.. perhaps this weekend! I found some great options of striped short sleeved tees in gray and white and black and white below. Just click on each top and it will take you to the different online shop for each one. They range from $13 - $35... great deal! About a month ago I was able to attend a baby shower for a friend from Clemson that I met when we were just freshmen. Christy has always been such a sweet friend and is welcoming a little baby girl in June. The shower was at her mom's house in Greenville and her sister found lots of inspiration on pinterest for the decorations and such. One of the sweetest ideas I've seen at a shower was this thumbprint tree where each shower guest could put their thumbprint (in pink or light pink stamp ink) and write their name in it. Then the print can be framed and hung in the nursery. We all left wishes and advice for baby Molly. All of the decorations were elegant and perfect for a baby girl but not overly girly. I have to share one of the gifts she received from a friend of her mom's who handmade a bunch of personalized burp cloths. All of the embroidery is so cute! The three of us (mom to be and Lena -soon to be a Mrs!) had such fun times in college and it was wonderful to get back together again to celebrate Christy! Doesn't she just look beautiful! I cannot wait for Molly's arrival! Spring is here for real in the Queen City! I love seeing all the blooming flowers but it's sad that it will all pass so quickly. At least the next season is my fave... summer! 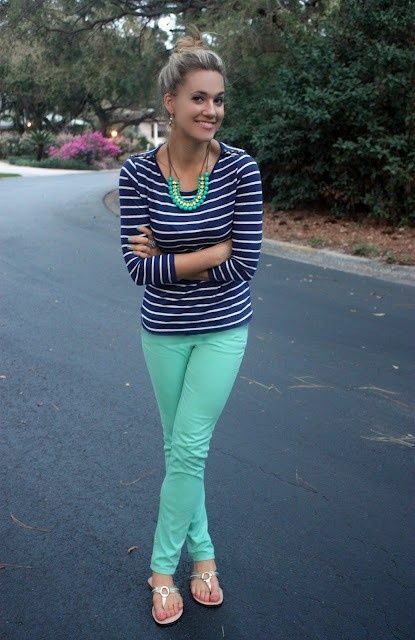 The Springtime made me want to incorporate mint into my outfits. The first is from the first dinner get together we had in our newly painted dining room, second is from a birthday luncheon for a friend/coworker and the last is an outfit I wore to work. Another view with the boots. I love the little pop of blue color on the back zipper. I was really excited to recreate this combo because it's been on my pinterest board for awhile (2nd photo below). 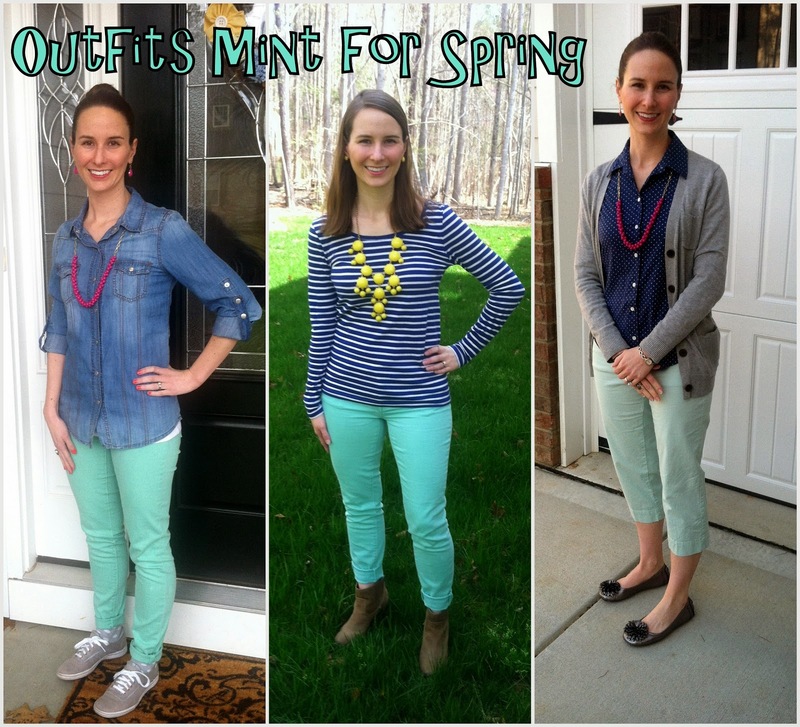 It's hard to decide which look I like best... probably the chambray with the mint jeans. This is a great recipe for Meatless Monday and bonus... it goes in the crockpot! Of course if you wanted to add some cooked ground beef or turkey you could. I have to say not having to pre-cook the lasagna noodles is a big win for a lasagna recipe in my book - they are perfectly cooked in the slow cooker. Although there was still some prep work involved for this recipe at least it didn't involve waiting for water to boil. One serving is missing in the photo because Eric was a little over-eager to have some lasagna before I could take a photo. Heat oil in large skillet on medium. Add mushrooms and peppers and cook for 3 minutes. Remove from heat and add spinach. Stir until wilted. Add tomato sauce. In small bowl, mix egg, ricotta, 1 1/2 cups of shredded cheese and 2 Tbsp fresh parmesan. Spoon 1 1/2 cups of sauce mixture into bottom of crock pot. Top with half the noodles broken to fit and half the ricotta mixture. Cover with 2 cups sauce mixture. Top with remaining noodles, remaining ricotta mixture and the rest of the sauce. Cover with lid. Cook on low for 4-5 hours or high for 2-3 hours. Sprinkle with remaining cheeses and leave covered for 10 minutes. Serve and enjoy. Here are some shots of the cooking and assembly. I love how colorful it is with the tomato sauce/red peppers and green spinach. We had our lasagna with a big salad and it was delicious! The day after I posted my Pattern Mixing What I Wore, we had a bit of a cold snap here in NC. I used that as a chance to pattern mix a top and bottom (since before I had mixed a dress and a cardigan) and a chance to wear my big polka dot sweater one more time until the fall/winter. If I have to have a cold day when it should be nice and Springy in mid-April then I might as well get to look cute right? Here is the other post with the sweater. Last month, we our friends Tyler and Whitney came to visit for the weekend from Delaware and brought their sweet 9 month old son, James, with them. Keith and Megan came up for the weekend too. The 6 of us usually get together once a year like when we went to Louisville one year, Gatlinburg one year, Asheville one year or last year Johnson City for the baby shower. But this was the first time it was the 7 of us and we were all so excited to meet James. We picked them up from the airport Friday morning and came back to the house to all hang out for the afternoon. We spent a good amount of time at our neighborhood playground and I was able to capture overwhelm James with my picture taking. He is pretty much paparazzi ready now. His favorite part of the playground was this tunnel. Here is a play by play of what I think James must have been thinking during tunnel time. "Hey dad, what are you doing in here? This tunnel is for kids." "Your big head is blocking my view of the windows over here. Time to move"
"Alright then, I'll just climb over you. Your hair makes for a nice grip!" "Now I have the tunnel all to myself" I just love his cute static hair! "Who is this guy with a strange smile holding me"
Even though this was not the best time of day for picture taking due to the super bright sun and he didn't want to look at the camera, I still attempted to get a few photos of James playing in the mulch. He really loved that stuff and it was all over him in a matter of minutes. On the walk back to the house, James decided he liked Eric better without his hat so he could feel his hair. After he got cleaned up he played in the exersaucer. Our amazing neighbors lent us a pack n play, high chair, stroller and exersaucer for James. The exersaucer was great especially because James had started pulling himself up and walking a few steps so you had to keep a very close eye on him unless he was in the exersaucer. That evening we went to Food Truck Friday. We got there pretty early so there wouldn't be much of a wait and so we could be back before James bedtime. After he went to sleep we enjoyed cupcakes, champagne and played games. Saturday after lunch at the house we enjoyed a beautiful afternoon at the Whitewater Center. James took a wonderful nap while we were there too. Yes Florida was playing basketball this day and won (too bad their streak didn't continue them all the way). When he woke up he really enjoyed hanging out in the picnic table area. Saturday night we had tacos at the house with Crock Pot Shredded Chicken and we played games again. Sunday was a really lazy day since it was rainy and cool all day. We all hung around the house and played with James and watched lots of basketball (this weekend was during March madness after all). We got take out Thai takeout for dinner. Monday morning Eric drove our visitors to the airport to fly home. We really enjoyed a fun weekend and meeting James and cannot wait to visit them sometime in Delaware! When I first started seeing pattern mixing, I was excited to try it. I have worn mixed patterns before but mostly in an accessory like a floral scarf with a striped dress. This is the boldest example of pattern mixing so far. The key I have found is in varying the size and type of the prints (much like you would mix patterns in pillows on a couch or bed). With this outfit, the dress has a bigger aztec pattern and the cardigan has a small dot pattern. A dot pattern the same size as the aztec pattern or a different aztec pattern in the cardigan would not make for great pattern mixing. If you want to start out easy pair a patterned top or dress with a striped or dot cardigan/blazer/scarf or vice-versa! I haven't tried patterned pants with a patterned top yet but maybe I'll get brave and do that soon. I continue to love this Francesca's dress! I styled it a few different ways on our Europe trip here and with a blazer and flats here.